It always blows my mind how, when it comes to recipes, just a small change in technique can have such a different result. For example, flourless chocolate cake is one of my favorite desserts to whip up. If I make it using whipped egg whites that are gently folded in at the end, the resulting chocolate cake is so light and fluffy. In comparison, if I add the eggs in and whip them up with all the other ingredients, the resulting chocolate cake is more dense, almost fudge like. Now, they are both delicious, but, it’s hard to imagine that the exact same ingredients went into each! Last night when I was watching episode 7 of season 2 of The Great British Bake Off, one of the contestants decided to make his own puff pastry using a rather unconventional method. Instead of layering butter and dough and rolling them out together and folding and chilling and repeating and re-repeating, he decided to roll the dough INTO the butter using a stand mixer. The judges, though skeptical, seemed intrigued. And I found myself wishing he would pull it off so I didn’t ever have to try to spend hours and hours making pastry dough. Unfortunately, his puff pastry ended up having him sent home as it wasn’t quite as flaky or crisp as the puff pastry just about every one of the other contestants had made. Which just goes to show, it’s technique, technique, technique – right?! Which brings me to this Easy 5 Ingredient Charred Zucchini And Caramelized Onion Salad you are looking at. For this salad, I received a cooler of fresh, organic Zucchini from Divine Flavor. Divine Flavor is a Mexican family-run and grower-owned distribution company based in Nogales, Arizona that believes in growing “Better Food for a Better World.” As such, the company produces fresh, non-GMO foods grown in nutrient-rich, never over-farmed soil. Divine Flavor was created in 2006 under the Grupo Alta company umbrella and distribute their products in the US and Canada. If you’d like to learn more about them, head on over to their website and follow them on Facebook, Instagram and Twitter. 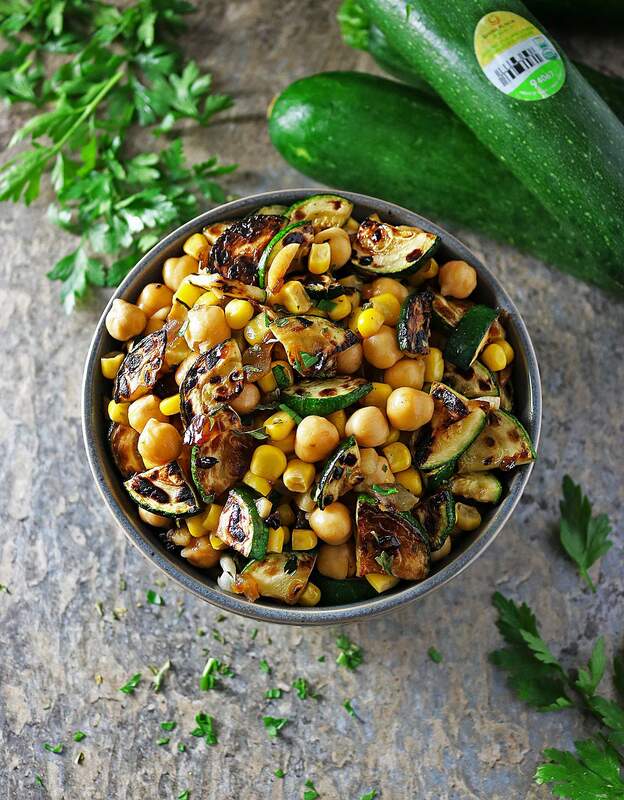 Now, getting back to this Charred Zucchini And Caramelized Onion Salad…I was challenged to keep the ingredients involved in this to 5 or below. Now, I usually use a ton of turmeric, coriander, and the like, in my recipes. But, with the cap on ingredients, I figured I would have to add flavor into this warm salad in some other way. And that’s when I thought why not caramelize the onions and char the zucchini! Y’all – the resulting salad was so good, so flavorful! I actually enjoyed it without feeling the need to douse it with a shaking of coriander or cumin or sriracha! Now, I added in a little garlic, sweet peas and corn – but, you can easily sub out the corn and peas for black beans and lima beans and serve it for your holiday meal. Or, sub in black eye peas and collard greens are serve it for your New Year’s meal! 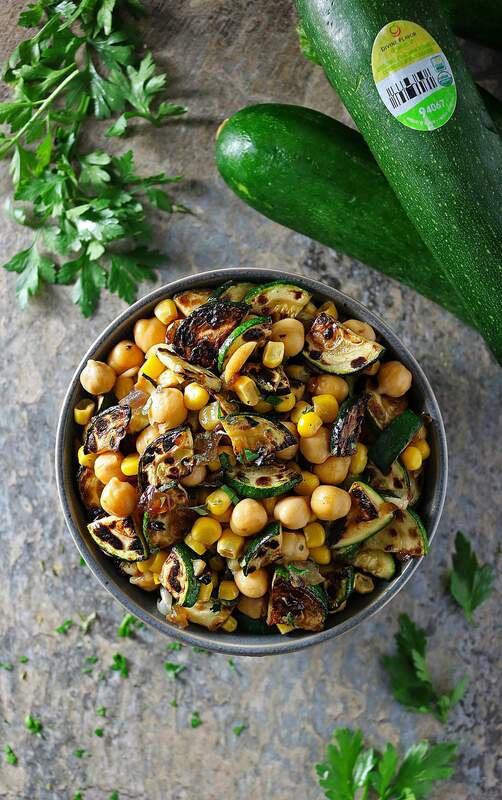 As long as you char the zucchini and caramelize the onions, you will have one heck of a delicious warm salad to enjoy! Dice red onion and place it in a pan with about 2 tbsps of the olive oil and make sure the flame is low. Stir onions often and let them caramelize - this is a long process (about 25-30 minutes) but adds so much flavor to this simple salad. Next, dice garlic and toss in with caramelizing onions and stir well. If needed, use a couple splashes of water or vegetable stock to deglaze the pan. After a couple of minutes, spoon the onion and garlic mixture onto a plate and set aside. Next, slice the zucchini and add the rest of the olive oil to the pan. When the oil is warm, add the zucchini and let the slices sit for about a minute or two. Make sure to check and when they have a char on them, flip them and let them char on the other side as well. 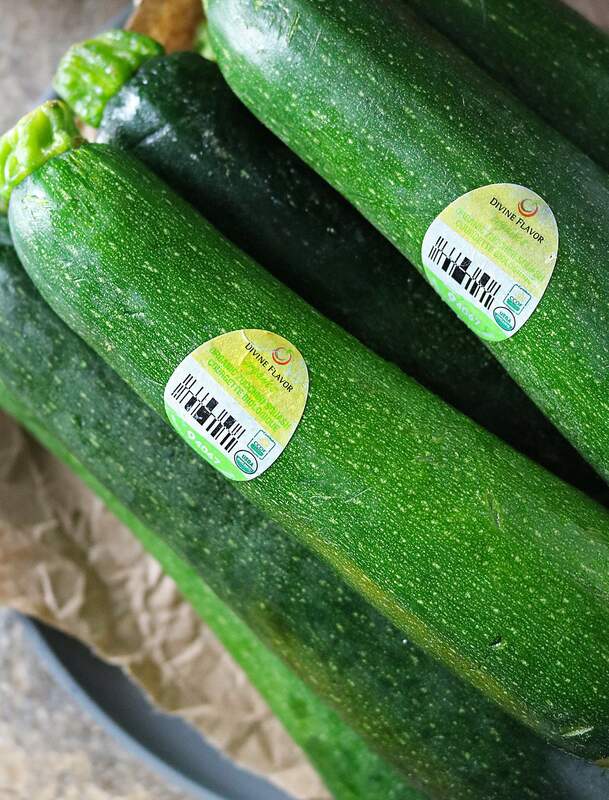 Charring the already flavorful Divine Flavor Zucchini gives it such a delightful taste. 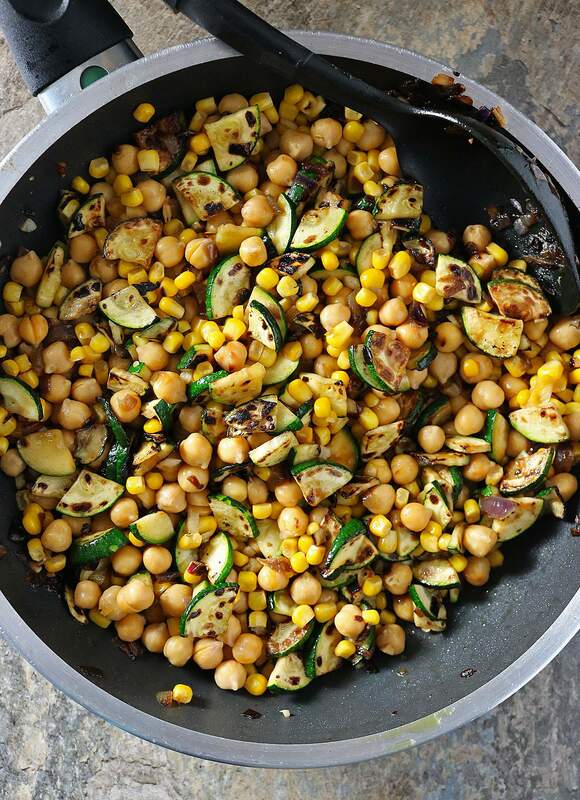 When zucchini are charred, add in the caramelized onion and garlic mixture, toss in the corn smf chickpeas and stir a minute or so. Season with salt and pepper if needed and sprinkle with a bit of parsley and enjoy as a holiday side. A simple and very delicious side dish. That salad looks amazing!! Hearty and delicious. Perfect for winter. I pin the recipe for later. What a delicious looking salad! 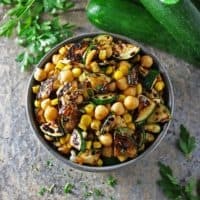 I love the combination of caramelized onions and charred zucchini! I agree – everything is technique — and BTW – I would never consider making my own puff pastry. Ever. Leave it to the professionals. This salad, however, looks like something I could tackle. Healthy and delicious! I would be happy to eat this as a meal. It does make a lovely side, too! What a fun idea! 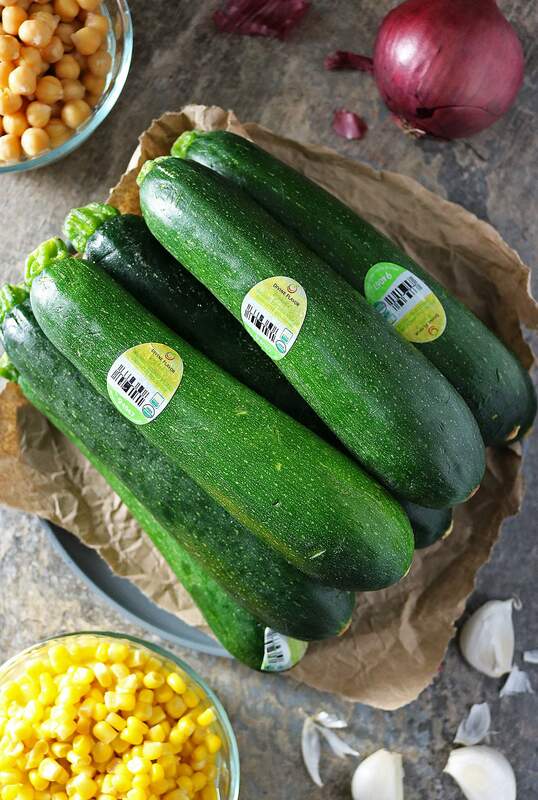 I always think of zucchini in the summer when my garden is literally overrun by it…but it really does make for an excellent winter ingredient, too. And I’ve never thought about charring it before. I love it! This salad sounds like it’s packed with flavor, and it would make an excellent side dish for the holidays and after. It’s the kind of side dish that I always crave in the winter as it’s packed with delicious flavors! 🙂 And too bad the puff pastry experiment didn’t work out…that would’ve been quite handy!